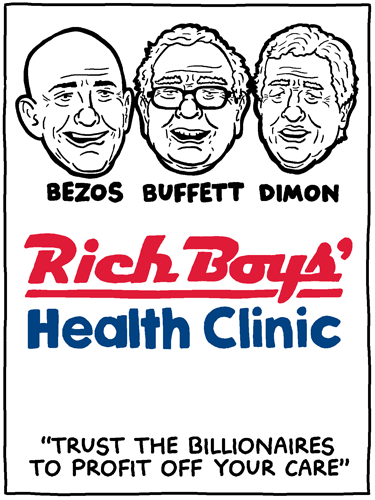 Call me a cynic, but I don’t think these three billionaires have their employees’ best interests at heart when they claimed to be working to reduce healthcare costs. Especially when one of them runs heat-exhaustion warehouses, another profits off predatory mobile home loans, and another ruined the economy and got a bonus for his efforts. The only help a billionaire should offer is to shut up, and pay more taxes to fund single-payer health care.